Almost half of all Americans take a vitamin supplement, and yet many large-scale, placebo-controlled clinical trials of various supplements have found little or no benefit. Vitamin E's positive effects often fail to manifest themselves as strongly as expected, but sometimes administering vitamin E actually has detrimental effects. An international team has now found a possible cause for this. According to researchers, the blue light from laptops, smart phones and other digital devices, could raise the risk of blindness. The study appears in the latest issue of the journal Scientific Reports. 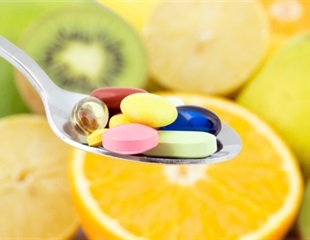 Many people have been advised to take vitamin supplements to boost their immune systems. Administration of 50 mg per day of vitamin E decreased the risk of pneumonia in elderly male smokers by 72% after they quit smoking, according to a paper published in Clinical Interventions in Aging. In order to extend the life of fruits and vegetables and preserve them for longer refrigeration, UNAM researchers developed an edible coating with added functional ingredients applied to freshly cut foods. New research shows that the estimated one-third of Americans who have a cluster of health problems that add up to metabolic syndrome don't absorb dietary vitamin E as effectively as healthy people. Results revealed today at The International Liver Congress 2015 show that vitamin E (d-alpha-tocopherol) is an effective treatment for non-alcoholic steatohepatitis (NASH). NASH occurs when the liver becomes inflamed due to the accumulation of fat. Over time, persistent inflammation can lead to the formation of fibrous scar tissue in the liver and around its blood vessels, which can eventually cause cirrhosis. Extra vitamin E protected older mice from a bacterial infection that commonly causes pneumonia. Microbiologists and nutrition researchers from Tufts University report that the extra vitamin E helped regulate the mice's immune system. Results of a federally-funded pooled analysis of five prospective cohort studies indicate that cigarette smoking prior to the first diagnosis of lung (stage I), bladder, kidney or head and neck cancer increases risk of developing a second smoking-associated cancer. This is the largest study to date exploring risk of second cancers among current smokers. Scientists have found that eating almonds in your diet can reduce the risk of heart disease by keeping blood vessels healthy. A large new Northwestern Medicine- study upends our understanding of vitamin E and ties the increasing consumption of supposedly healthy vitamin E-rich oils -- canola, soybean and corn - to the rising incidence of lung inflammation and, possibly, asthma. Elderly people with high serum vitamin E levels are less likely to suffer from memory disorders than their peers with lower levels, according to a study published recently in Experimental Gerontology. As Americans sit down to enjoy Thanksgiving dinner, they often wish their family and friends good health and a long life. Good news! With nuts like almonds on the table, these sentiments are more than just a traditional toast.